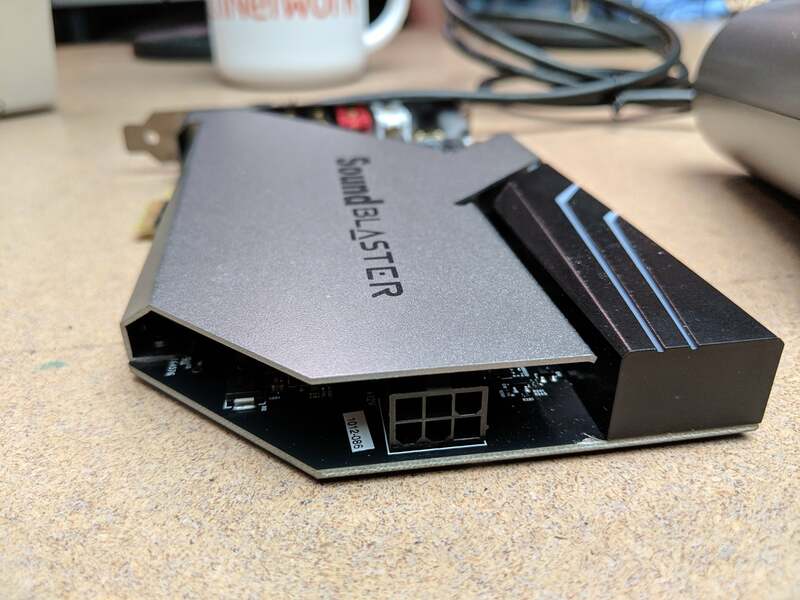 We get hands-on with Creative Labs' newest audiophile sound card: The Sound BlasterX AE-9. High-end audio lovers finally got the attention they craved this week when Creative Labs showed off its upcoming $300 Sound BlasterX AE-9 sound card. Aimed at a more discriminating class of audio listeners, the AE-9 features such audiophile features as replaceable operational amplifiers, or opamps, to tune the flavor of sound from the card. 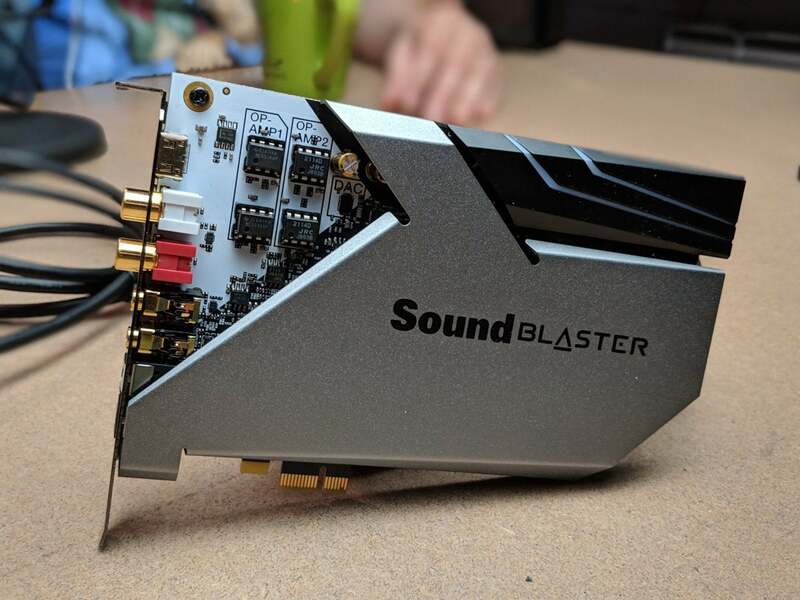 Following the introduction of the gaming-focused Sound BlasterX AE-5Remove non-product link and Sound BlasterX AE-5 PureRemove non-product link last year, the AE-9 kicks it up a notch or two. The card appears to have standard 3.5mm jacks for rear, center, and sub, as well as RCA stereo out and optical in and out ports. Although still based on the same Sound Core 3D chip as the AE-5 and AE-5 Pure, the AE-9 jettisons the on-chip digital analog converter, or DAC, in favor of an external DAC. The premise being that a high-end DAC will make the sound even more pristine. Creative officials said the card is rated at a 129dB signal-to-noise ratio and uses an ESS Sabre 32 digital analog converter. Since the AE-5 and AE-5 Pure both use an ESS ES9016 DAC, we figure the AE-9 is a step up to perhaps a Pro ESS DAC. Audio-fidelity folks will appreciate how the AE-9 gives them control over the operational amplifiers, which can be mixed and matched for desired tuning. Like the AE-5 cards, the AE-9 features XAMP, which amplifies each stereo channel of headphones out separately as well. 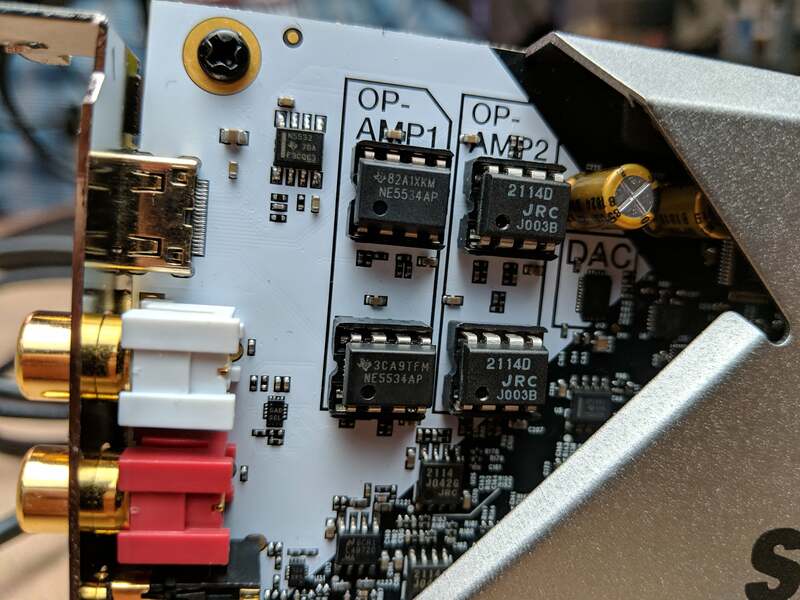 The Sound Blaster AE-9 will feature replaceable opamps so consumers can tailor the audio if they so wish. We’re not sure if these are final shipping opamps or not. 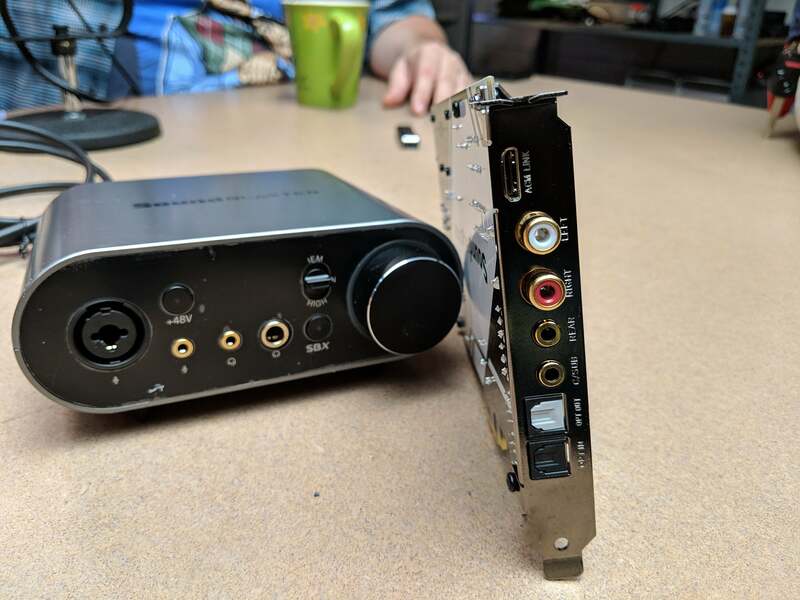 In a first for a sound card—the AE-9 relies on a 6-pin PCIe connector for power. That’s up to 75 watts of power for the AE-9. Besides direct power being cleaner, the added power for the card is to help run the ports on the new breakout box. The AE-9 gets the bulk of its power through a 6-pin PCIe connector. That means the AE-9 can draw up to 75 watts of juice. 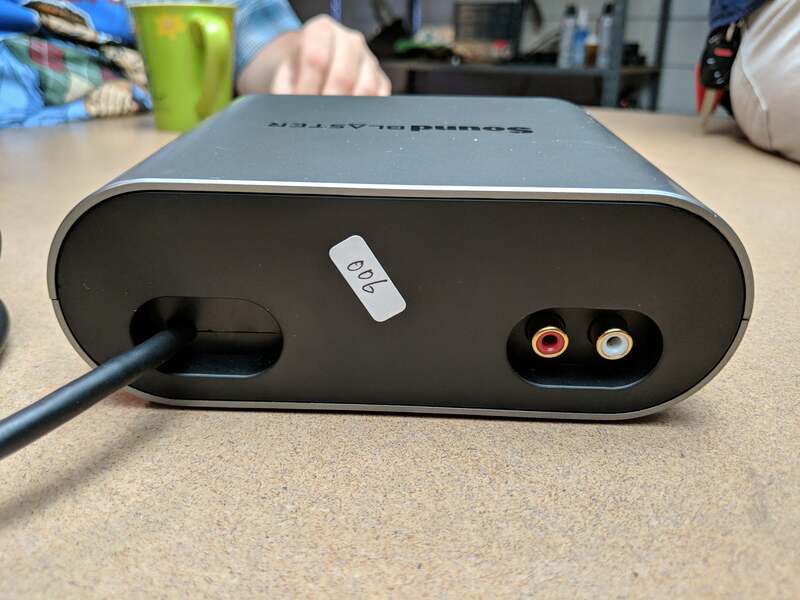 The new breakout box features a single combo jack that supports both TRS and XLR connectors for microphones and 48-volt phantom power. The mic jack is a nod to musicians and likely YouTubers who prefer very high-end microphones. The front features a 3.5mm mic and headphone port along with a quarter-inch headphone jack. There’s a button to enable 48-volt phantom power and what looks to be a switch for high-impedance headphones. The SBX lets you control the 3D virtualization technology without going into software. The knob, obviously, is for volume. 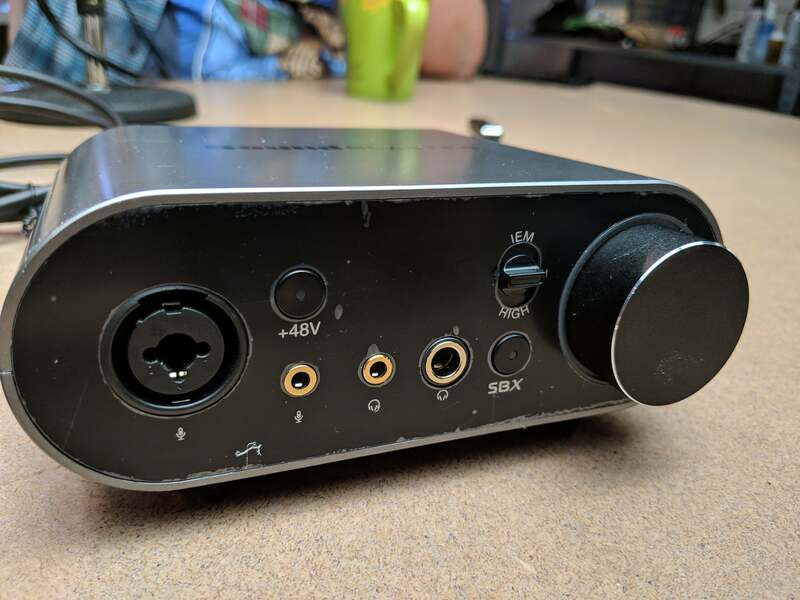 The breakout box for the new Sound Blaster AE-9 features 45-volt phantom power support for microphones using XLR and TRS connections. And yes, this card is so new that the protective plastic has not been peeled from it yet. The back of the breakout box features a pair of RCA-style connections that we’d guess are analog-in for those times when you want to record audio from, say, FM radio, which is how people used to do it. The rear of the new AE-9 breakout box likely features two RCA analog ports. The cable that connects the breakout box to the sound card looks like it appropriated a mini-HDMI connector. We suspect it’s not electrically the same (since it doesn’t carry video) but it’s not uncommon for companies to use existing parts as a shortcut to avoid creating something new. Since mini-HDMI pretty much went nowhere, it’s unlikely to ever get mixed up. 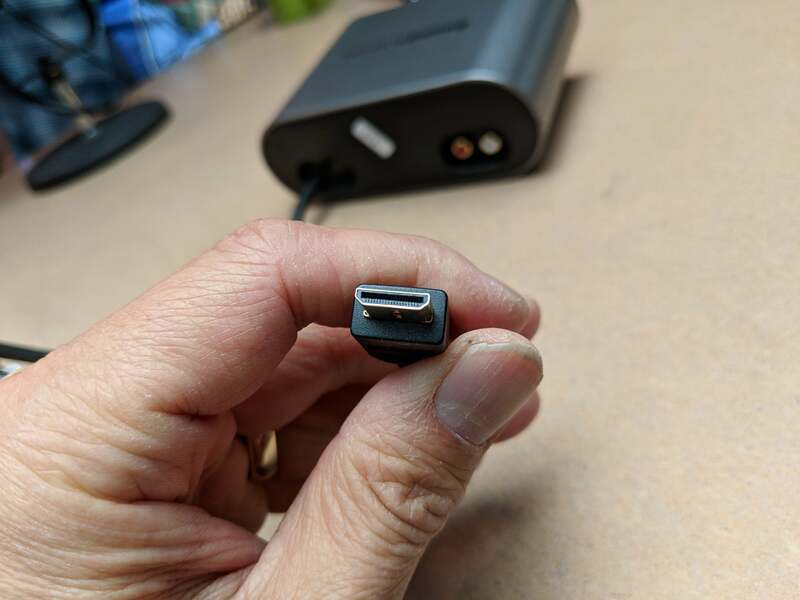 A single cable that connects the Sound Blaster AE-9 to the breakout box looks awfully similar to a mini-HDMI connector. At $299, the AE-9 is a pricey sound card. With a decent video card selling for the same or less, this card isn’t for the typical gamer. Officials said to expect the card on store shelves by the end of the month. If you want to see the unofficial world-wide debut of the card, tune in to our video show The Full Nerd to see Creative Labs’ Ryan Schlieper unveil the card and talk about the company’s highly touted Super X-Fi too.